We are proud to release our new single "Stroke Therapy" recorded at The Beach Audio by the students at the The Academy of Production and Recording Arts. Stroke Therapy is not about self pleasure. It is about musicians coming together to have a good time. 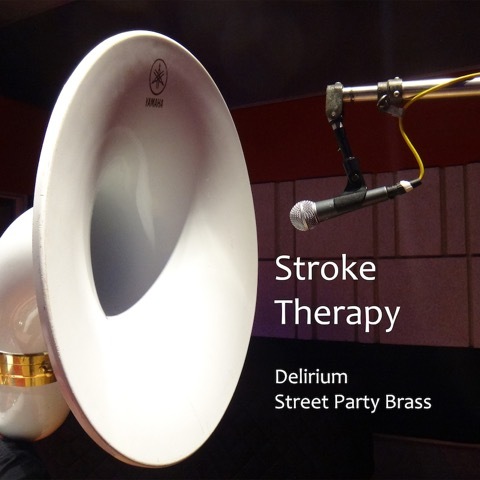 Delirium Street Party Brass suffered a major blow in 2017 when our lead singer suffered a stroke. While awaiting her recovery and return to the band, we focused on enjoying our musical journey together, and sharing the brass horn band love with more musicians in jams, while building the band into something bigger and better. This anthem starts slow with the tuba and builds in layers with different horn solos and increasing drum lines. As it reaches its first climax it drops through a high, bright, loud and clear trumpet solo, then back in the pleasurable layers of jam mental relaxation, before the happy ending back with the brightness of the trumpet. Our instrumental horn jam single in a 70's jazz funk tradition, our anthem to living life to its fullest and appreciating what you can get or give in the moment. Listen or buy on CD Baby, or stream it or buy it on on Spotify, Apple Music, iTunes, Amazon Music and other platforms.